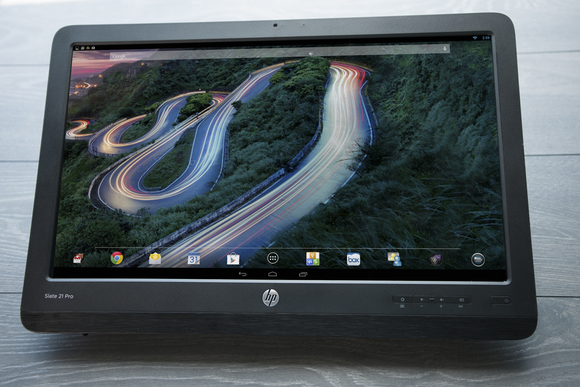 HP makes an all-in-one Android machine for the home: the Slate 21 All-in-One. But the company’s business-oriented Slate 21 Pro is a far better value. It has twice as much memory and storage, and it boasts a number of features that aren’t available on the consumer machine. Even better, it costs $20 less—just $379. 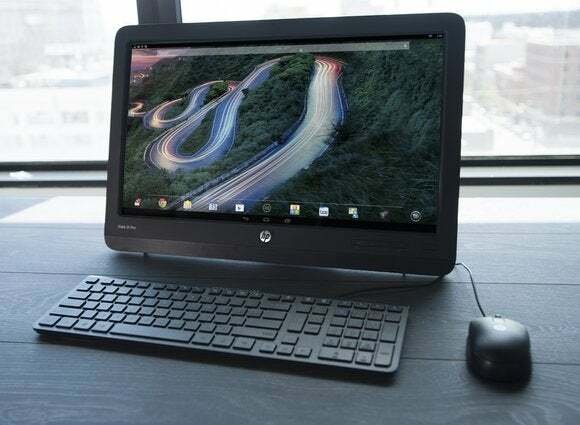 Like Acer’s larger TA272HUL, you can use the Slate 21 Pro as desktop computer with local or cloud apps, or you can plug in a conventional Windows computer (desktop or laptop) and use it as a touchscreen display (it has both an HDMI input and an upstream USB port). When you take the laptop away, you still have a completely functional PC—just not one that runs Windows. While it was designed for business users, HP's Slate 21 Pro is vastly superior to its consumer-oriented Slate 21. The Slate 21 Pro is based on Nvidia’s Tegra 4 T40S processor, supported by 2GB of DDR3/800 memory and 16GB of flash storage. That’s obviously not a lot of capacity, but most apps will run in the cloud. If you do need more, HP includes 50GB of free cloud storage via Box, and you can get another 15GB of free storage with a Google Drive account. If you want additional local storage, you can plug in an SD memory card or connect a portable hard drive to one of the computer’s three USB ports. Only one of these is easily accessible, however, being located on the lefthand side of the machine. The other two are near the bottom of the back panel, and they face up. 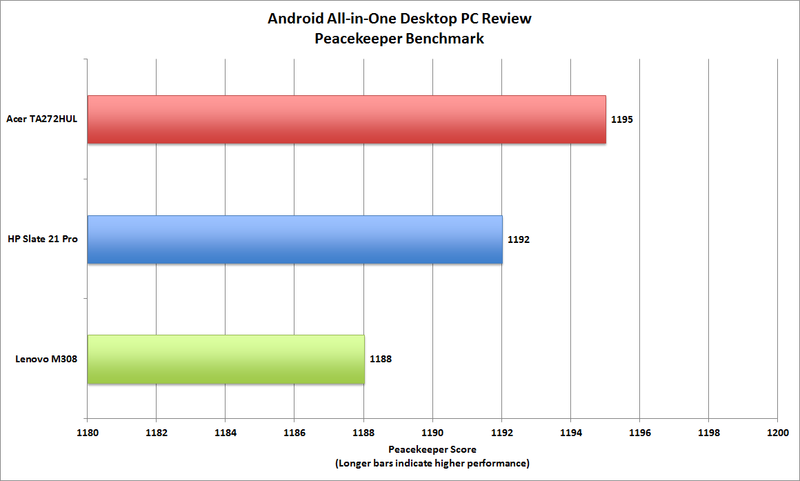 All three are only USB 2.0 (USB 3.0 is considerably faster). If you prefer local apps, HP bundles a copy of Kingsoft Office for Android that includes a word processor, spreadsheet, and presentation builder. These three programs can exchange files with Microsoft’s Word, Excel, and Powerpoint, respectively. The whole universe of other Android apps is also available to you—including portrait-oriented apps (some Android devices limit you to apps designed to run in landscape mode; the Slate 21 Pro scales them properly to fit its display). Acer's TA272HUL performed slightly better than HP's Slate 21 Pro in our benchmark tests, but that doesn't justify the Acer's oversized price tag. The Slate 21 Pro’s 21.5-inch display is an IPS model with resolution of 1920x1080 pixels. It’s a touchscreen, but it supports only two touch points, and it’s based on optical, versus capacitive, touch technology (it determines where your fingertips are on the screen using three cameras embedded in its bezel). So you open windows with a double tap, drag windows around the screen, and close them with a single tap. You can also pinch-to-zoom windows, but nothing more complicated than that. The spring-loaded stand on the back allows the computer to recline up to 70 degrees, which makes it easy to use whether you’re standing over it or sitting down in front of it. Remove two screws and you can remove the stand to reveal a VESA mount that can be used to attach the computer to an articulated arm. HP bundles a cheap wired mouse and keyboard with the box, and these (or any USB mouse and keyboard you might upgrade to) can control a Windows PC when you connect the two using the upstream USB cable. HP markets the Slate 21 Pro as a business machine, and it has clear value in that space—provided your business isn’t heavily dependent upon custom Windows applications, or is too small to run a virtualized Windows environment for that purpose. But it’s also a solid value for consumers looking for a capable, multi-purpose family PC. This is a great machine for the kitchen or family room, where it could be paired with a laptop, Xbox, or a set-top box when it’s not being used in stand-alone mode. Good job, HP.